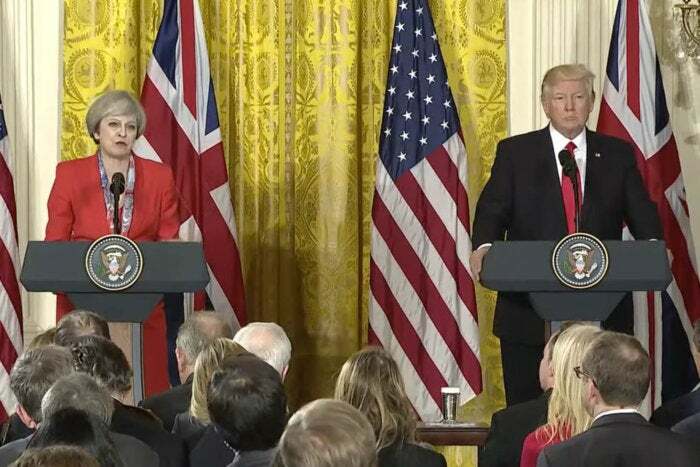 May was speaking at a White House news conference, alongside U.S. President Donald Trump, held to outline the results of talks between the two leaders. 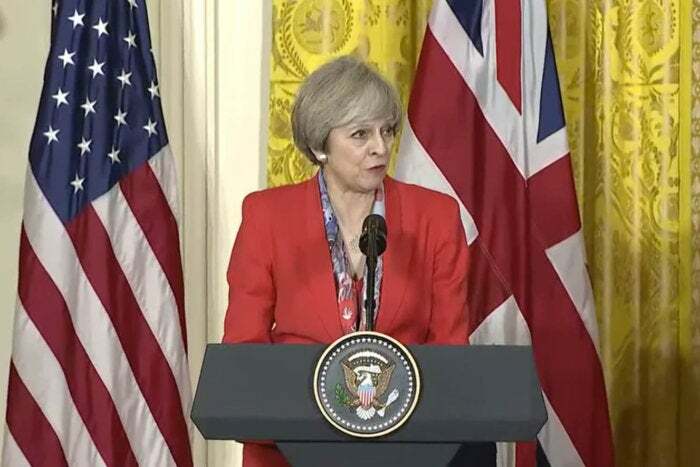 May is in Washington as the first foreign head of state to meet Trump. She noted the conventional military fight against ISIS is working and the group is losing territory but noted the two countries "need to redouble our efforts." "Today we’re discussing how we can do this by deepening intelligence and security cooperation and critically, by stepping up our efforts to counter Daesh in cyberspace," she said, using an alternate name for the terrorist group. "We know we will not eradicate this threat until we defeat the ideology that lies behind it," she said. British Prime Minister Theresa May speaks at a White House news conference on Jan. 27, 2017. The issue of radicalization via the Internet has been more strongly felt in Europe than the U.S., and there have been several instances of people turning to the group after reading and studying online material. The precise details of the planned cooperation are not immediately unclear. On Thursday in Philadelphia, May told a Republican Party retreat of the danger posed online by radical groups. "The terrorists are exploiting the internet and social media to spread this ideology that is preying on vulnerable citizens in our own countries, inspiring them to commit acts of terror in our own cities," she said. She noted that care should be taken to distinguish radical views from the peaceful views of Islam. May also said the two leaders discussed NATO and its role in cyberspace. "Today we’ve reaffirmed out unshakable commitment to this alliance," she said Friday. They are reassuring words to European countries that had worried Trump's previous criticisms of NATO meant his support for the alliance was wavering. "We’re also discussing the importance of NATO continuing to ensure it’s equipped to fight terrorism and cyberwarfare as it is to fight more conventional types of law," she said. Trump stood alongside her as she delivered her remarks and answered questions from reporters on other issues, but he didn't address the two cyber issues.